Ever read a book that didn’t end? 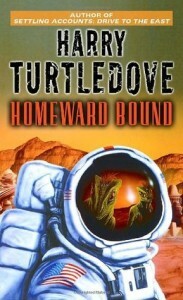 So, I just finished reading Harry Turtledove’s HOMEWARD BOUND, which is the eighth and last book of his alien-invasion alternate history Worldwar series. The series goes: Worldwar Books 1-4; Colonization 1-3, and then Homeward Bound, which is where a small number of humans visit the Lizard home world. I must admit, I skipped over the Colonization trilogy. I liked the Worldwar series okay, but not enough to want to read another zillion pages in the universe. I found there were enough references to important events of the Colonization trilogy in HOMEWARD BOUND that having skipped them was no trouble. This may be the least-finished story I have ever read. I mean, of stories that are meant to be taken as finished; not stories like McKinley’s PEGASUS which are just stalled. I’m almost sure I picked this book up at a library sale. I had it on my TBR shelves for a long time, along with the first Worldwar book. Homeward Bound came out in 2004, so I presume if Turtledove meant to publish other works in this universe, he would already have done so. I mean, he’s written plenty of books since. So he must think he’s finished with this world. Well, I don’t think so. I thought it just . . . petered out. The big question, about whether there would be an immense war that would wind up destroying all three planets of the Lizards and probably Earth as well? Yeah, don’t know. Maybe it’s going to happen a week after the book closes, maybe it’s not going to happen at all, no way to guess. The lives of the important characters? Nope, no feeling of completion there, either. It’s like their character arcs go up . . . and start down . . . and then just fade away without reaching any kind of resolution. It’s really rather odd. My final take on this book and the series generally. 1. The history elements are awesome. You can sure tell Turtledove is all about the history. 2. The writing is adequate, if unexciting. Turtledove could have cut at least 50 pages from each book, maybe more, if he had stopped repeating himself so much. WE GET THAT LUDMILLA’S PLANE IS ITTY-BITTY. We don’t have to hear about that every. single. time. that Ludmilla appears for an entire four-book series. This kind of repetition applies to absolutely everything. I got the feeling that Turtledove just doesn’t trust his readers to remember anything for more than 30 pages. It was tiresome. Other than that, though, the writing was fine. 3. Man, I SO expected Colonel Heinrich Jäger to shoot Hitler. I mean, isn’t part of the fun of writing WWII alternate history getting to have someone shoot Hitler? I could not believe this didn’t happen. 4. The Lizards are pathetic. If your planet is going to be invaded by aliens, these are the aliens to choose. They are technologically static, almost unable to adapt to unexpected circumstances, utterly entirely unable to comprehend other species’ point of view, completely unprepared for conquered populations to resent and try to sabotage them, and — get this — they find ginger extraordinarily addictive and it all but destroys what small ability to cope they have. Also, as an entirely separate issue that probably does not annoy most readers, socially, the Lizards are not believable. I see no possible way to get lack of family bonds in a social species. It doesn’t matter that there are no male-female pair bonds. When a female lays eggs, she is 50% related to each potential hatchling and it is not possible for that not to matter. When the young hatch, they are on average 50% related to one another, and in a social species that is going to matter, too. In any group, you will be much more closely related to some individuals than others. You WILL get preferential care of your OWN relatives under those circumstances. Shoot, little corn snakes, with no brains to speak of and no social behavior that matters, curl up around their eggs and guard them. And crocodilians makes snakes look just sad when it comes to maternal care. The lack of family bonds in Lizards is just impossible. Therefore the lack of any family or tribal structure in modern Lizards is not believable, either. Back to the Lizards in story terms, though. Everyone, both Lizard and human, seem convinced that if the Lizards had invaded a few hundred years earlier, they’d have walked right over the knights-in-shining-armor that were the height of human technology at the time. Because of the thing with repetition, we get to hear various characters say so over … and over … and over. Well, I’m not convinced. Remember Anderson’s THE HIGH CRUSADE? I can totally see that scenario playing out in Turtledove’s universe. 5. I felt really bad for Uzzmak. I would never have wound up his story the way Turtledove did. No, not even to make the Soviets look brutal. They looked brutal enough without that. 6. The technological twist that is so important in HOMEWARD BOUND is beyond predictable. You can see it coming not just from miles away, but from light years away. 7. There is no ending. Here is how I would have ended the story: I would have startled everyone, Lizard and human alike, by having another alien species unexpectedly show up with FTL drive and unknown technological capabilities. Wow, I bet NOW both Lizards and humans are WAY less eager to go to war and destroy each other. Who knows if they’ll suddenly need all their resources for other purposes? Maybe they’ll even need each other as allies! The one thing we know for sure is that Lizards and humans can work together if they have to — maybe that might prove of overwhelming importance, huh? And you know who might be pretty good as an ambassador to a brand-new totally unknown species? Why, Sam Yeager, that’s who, and no doubt his son Jonathon, and shoot, maybe Kassquit and Donald might themselves particularly well-suited to that kind of effort. NOW we can resolve some of those character arcs as well as the overall situation. I really, honestly thought Turtledove might do that. In fact, I was more than half convinced that was going to happen. But, no. So. As alternate history, I guess the series is fine (I’m not the best judge of the subgenre). As a novel of first contact, the aliens are too inferior to humans and it’s really annoying. As a story, though the initial four-book series concludes properly and I presume the Colonization trilogy most likely does as well, the series as a whole offers very little sense of arriving somewhere or accomplishing something. General rating: I dunno. Six out of ten for the Worldwar quadrilogy, maybe six and a half. Five out of ten for HOMEWARD BOUND, maybe four. If you’ve read this series, did you also feel that it didn’t really end and did you feel that was a problem? Can anybody else offer an example of a story that just seemed to peter out without actually ending? 4 Comments → Ever read a book that didn’t end? I love The High Crusade, but Anderson doesn’t so much stack the deck in their favor as give them a deck that’s all aces. I think even the Lizards could win against a military force whose best distance weapon was the longbow, and who were economically dependent on agricultural land that can’t be defended from aerial attack. I wouldn’t rule out interim victories a la Isandlwana or Little Big Horn. But I don’t see them adapting fast enough to come up with countermeasures for air supremacy and automatic weapons. Ugh. Turtledove is an OK plotter and a boring writer with a lazy editor. I DNFed the series so I can’t comment on the last book. But I believe it. Yes, Pete, I’m reading books by Lani Taylor right now and there is just no comparison. She’s making Turtledove’s writing look more boring in comparison. Mike, I don’t know. The Lizards are SO resistant to innovation and SO unable to cope with human resistance. I think they’d have gotten nominal surrender followed by humans taking over in fairly short order. Well, you can read Karen Memory for some alternate fiction. I just finished rereading it for the third time. And it came out in April.